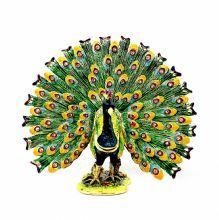 Tail widely spread out and studded in crystal, This peacock trinket box is eye catching and breathtaking, what a beautiful unique gift. 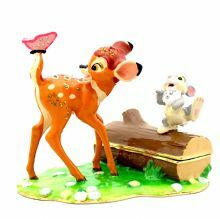 Bambi trinket box, Disney's beloved deer character, looking back, a butterfly sitting on his tail and Thumper, his rabbit friend, laughing with paw up turned. 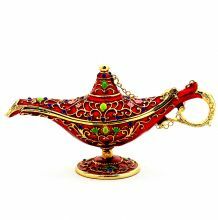 Crafted in enamel and crystal decorated, a trinket box for all Disney fans. A trinket box crafted as a lamp in metal and enamel, This crystal studded lamp in brilliant red is stunning. 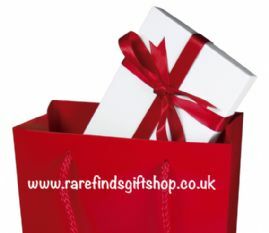 A perfect gift for a collector of trinket boxes, or things unusual. 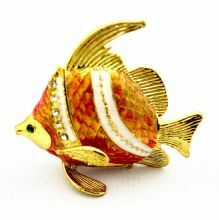 Gold tail, gold fins and crystal decorated gills? Who would have thought this is a trinket box. Open it to reveal the interior all in gold too. Marine blue Sea Urchin trinket box, with clever design, looking real and succulent. This large trinket box is for someone who loves the sea and collects knick knacks. 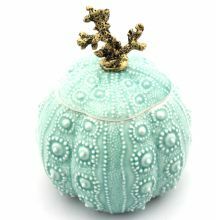 The little Sea Urchin trinket box is small enough to sit in the tiny corner, yet attractive enough to be an added decor. A trinket box designed with trinkets. 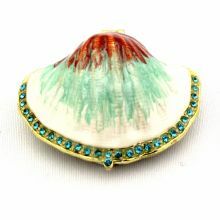 This multi-shade oyster trinket box has blue crystals on its rim and a gold clasp at the bottom. Open it - no pearls! Just a shiny yolk yellow tiny space for trinkets. How intriguing. This charming tall cottage is a trinket box. Opens in the roof, it is designed with loads of details, including a cow by the door. The roof comes off and this lovely thatched cottage is a trinket box. Intricately designed with lots of details, a family front and back doors and yes, windows. So pretty.